VENEZUELA has been hit by the biggest earthquake to strike the nation for centuries, with the 7.3 magnitude tremor felt as far as Trinidad and Colombia. It was so big and deep it actually prevented disaster from ravaging the strap-cashed country. Yesterday’s earthquake was the largest to strike Venezuela since 1900, according to the United States Geological Survey (USGS). There have been 17 previous magnitude-6 quakes and scores more smaller tremors in the region – but large earthquakes are rare. 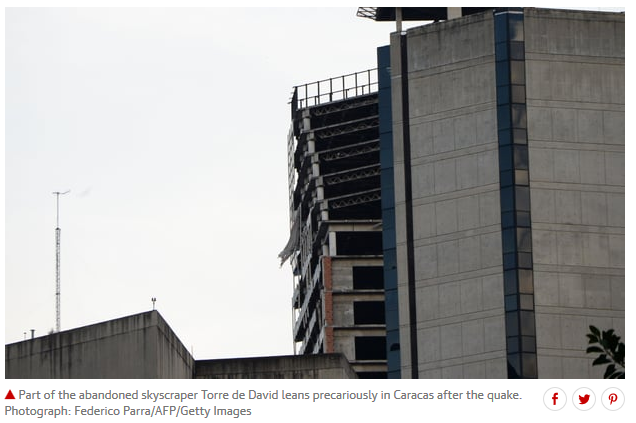 The USGS recorded the earthquake in the coastal town of Irapa with a depth of 76 miles (123 kilometres) and tremors were felt 286 miles (622 km) away in the capital of Caracas. Its magnitude was recorded at 7.3, making it the largest historic event within 155 miles (250 km) within this location in the 20th and 21st centuries, the USGS said. Seismologist Lucy Jones, a research associate with the California Institute of Technology said the earthquake’s considerable depth likely prevented a tragedy. She added “shaking does die off at a distance”. The USGS said earthquakes such as these with focal depths between 43 and 186 miles (70 and 300 km), are commonly termed "intermediate-depth" earthquakes. They typically cause less damage on the ground surface than in the case with similar-magnitude shallow-focus earthquakes. Adding: “Large intermediate-depth earthquakes may be felt at a great distance from their epicentres. The quake, which was centred near the town of Guiria, caused buildings to be evacuated but there were no injuries.